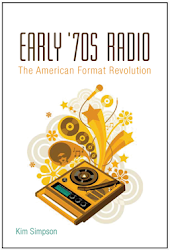 Welcome to the companion blog for my book Early '70s Radio: The American Format Revolution, which comes out in late July. This blog will be a very loose and (mostly) informal survey of thoughts, commentary, and side notes related to the book, radio, and early '70s American culture in general. Please chime in on anything related to those subjects - including any of your favorite radio stations, radio personalities, and major/minor radio hits that I should have mentioned - by emailing me at ksimpson3 at gmail dot com. Thanks in advance for having a look at the book and for visiting.